Casa Puesta del Sol manages to be extremely chic and elegant without feeling stuffy or uncomfortable. It has high ceilings, gleaming surfaces, an open design, and wrought iron accents. There’s a gallery upstairs that overlooks the foyer below, and rainforest views are visible through almost every window. It’s ideal for families, because there’s three master suites upstairs and two children’s suites downstairs. Plus, it’s in a gated community with its own restaurants, activities, and amenities. Amazing views over 3 different bays and the rainforest! 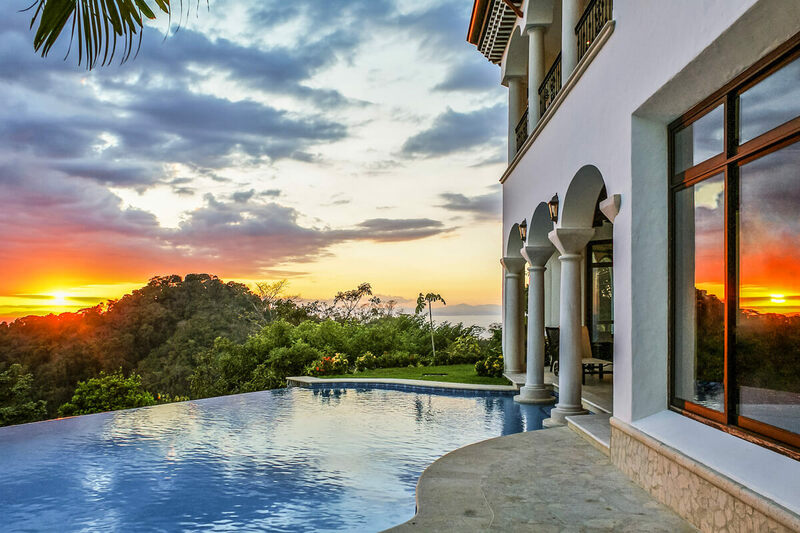 Casa Puesta del Sol sits high on a mountain top in Vista Tres Bahias, an exclusive gated community in the Los Suenos Resort. With an elegant design and views of the rainforest and three bays, this villa is ideal for any group of travelers. Tropical foliage stretches up the hill to the freeform pool, which has submerged loungers and a wading area. Dining and lounging nooks surround the pool and open to the polished interior. Checkerboard tiles in the foyer connect the living room with the kitchen, and chandeliers add luxury to every space. Exposed ceiling beams and tall arched windows add elegance to the living room’s warm wooden furnishings, and a flatscreen TV with a DVD player and sound system provides entertainment. The gourmet kitchen is across the entryway, and has an open design with stainless steel appliances and expansive marble countertops. The laundry room and the dining room sandwich the kitchen. The hallway by the living room holds two identical suites that each have two full beds, a walk-in closet, and an ensuite bathroom with a rain head shower. The hallway also has a powder room with a rain head shower. A wrought iron staircase spirals upstairs to the galley. A wrought iron railing overlooks the entryway and connects the three remaining bedrooms. Sliding glass doors across the galley open to the balcony, where guests can sip cocktails as the sun sets over the rainforest. The queen suite enjoys rainforest views through three arched windows, and has a walk-in closet attached to the ensuite bathroom. The king suite opens to the upper balcony and has a massive rain head shower in the ensuite bathroom, which is attached to the walk-in closet. The other king suite has a glamorous, spa-inspired bathroom with a clawfoot tub and a rain head shower. It has not one, but two walk-in closets. All five bedrooms have a flatscreen TV. Casa Puesta del Sol is on a steep hill, so only four-seater golf carts are allowed. Taxis are available 24/7 to take guests to Los Suenos’ restaurants, activities, and water sports. There is an approximate 4 minute drive to Playa Herradura.